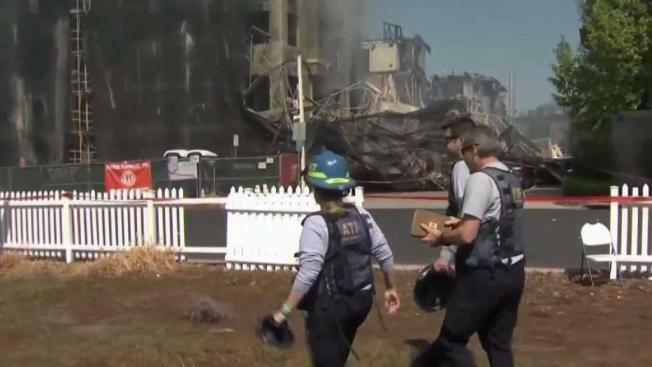 A national response team with the U.S. Bureau of Alcohol, Tobacco, Firearms and Explosives were on the scene Wednesday to help look into what sparked a three-alarm inferno at an under-construction apartment building in Concord early Tuesday. Christie Smith reports. 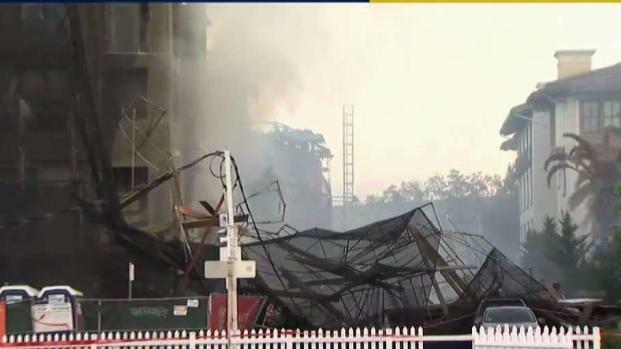 A national response team with the U.S. Bureau of Alcohol, Tobacco, Firearms and Explosives were on the scene Wednesday to help look into what sparked a three-alarm inferno at an under-construction apartment building in Concord early Tuesday. "We look forward to everyone in the city working together, and that's our name: Concord. We live in concordance with one another. We look out for one another," said Concord Mayor Edi Birsan at a news conference Wednesday afternoon. ATF Special Agent in Charge Jill Snyder said teams are conducting investigative lead on the incident and scene documentation, taking photographs and videos of the building. Once the documentation is done and the scene declared safe, crews will begin to physically investigate the area. 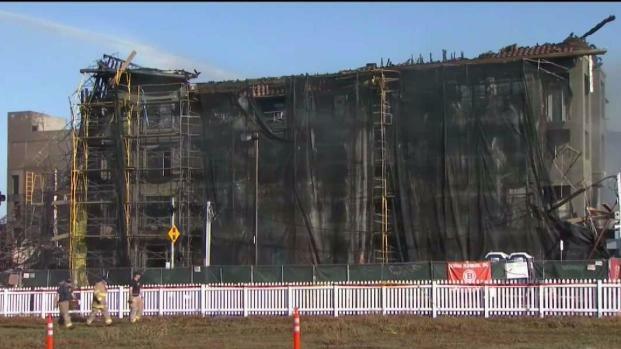 A wall of scaffolding at the burned down building will be demolished Thursday morning due the fact that it's "right next to the apartment people evacuated from," Assistant Fire Chief Terence Carey of the Contra Costa County Fire said. A national response team with the U.S. Bureau of Alcohol, Tobacco, Firearms and Explosives on Wednesday is slated to help look into what sparked a three-alarm inferno at an under-construction apartment building in Concord early Tuesday. Pete Suratos reports. 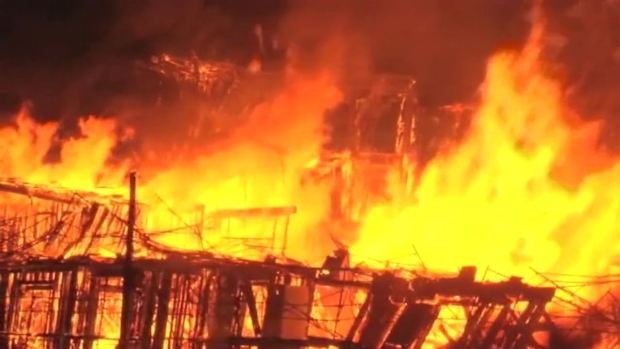 Towering flames torched the 180-unit apartment building and left burned debris structurally unstable, forcing 250 residents at a neighboring apartment building to evacuate, according to fire officials. Scorched scaffolding soaring multiple stories into the air fell over onto a road and parked cars Tuesday hours after crews gained control of the flames. Firefighters believe other portions of the burned structure could also topple, according to a fire official. The blaze, which sent flames shooting into the air over the area of Galindo Street and Concord Boulevard, was pronounced under control after an hours-long onslaught from firefighters, but the building is considered to be a total loss with approximately $55 million in damages. "This is the largest fire in memory here," Concord Mayor Edi Birsan said Tuesday. "Fifty-five million dollars is a substantial amount and will be an impact on the city." It is not clear at this time what sparked the blaze, according to officials. Fire officials are conducting an investigation, which is expected to last several days. Flames engulfed a building in Concord Tuesday morning. The apartment building was under construction. Contra Costa County Fire Protection District Fire Marshal Robert Marshall said there is a concrete parking garage at the center of the fire site. The wooden, under-construction apartment building wrapped around the garage is what caught fire. Fire crews will be on scene until Wednesday morning working on containing hot spots. Residents in the Renaissance Square apartments were forced to evacuate as a result of the nearby inferno, according to fire officials. They were given a few minutes Tuesday afternoon to collect some of their personal items from their residences, but they were still not allowed to return home for good as of Wednesday morning. It is not clear when the displaced residents will be allowed to return to their homes, according to fire officials. Crews are evaluating the stability of the structure that was torched. There is a risk that the charred walls of the burned structure could fall. "We don't know whether it would collapse in or whether it would collapse out," Scott Hill with the Contra Costa County Fire Protection District said Tuesday. "If it collapsed out, it would possibly infringe on the neighboring building, the evacuated building." A number of roadways surrounding the scene of the blaze were closed to allow for crews to battle the flames and investigate, according to police. Some roads have since reopened, but closures are in still in place at Willow Pass Road and Galindo Street, Willow Pass Road and Sutter Street, and along Concord Boulevard from Galindo Street to Mira Vista Terrace as of 4 a.m. Wednesday. It is not clear when the roadways and intersections will reopen, but the heart of downtown Concord including Todos Santos Plaza is accessible. "Downtown Concord is open for business," Concord Police Department Lt. Nick Gartner said Tuesday. "The plaza is accessible, but the surrounding area around this block where the structure fire took place is going to be shut down so public safety can do their work."